ORIGINAL MAKE/MODEL: Suzuki GSX1300R Hayabusa. ENGINE: 2004 Hayabusa, fully stripped and rebuilt, forged JE pistons, barrel spacer, new mains and big ends, valve seats re-cut and lapped, minor porting job, heavy duty head studs, heavy duty clutch springs in modified basket, billet clutch slave support bracket, Garrett GT25/28 turbocharger with dynomutt boost control system, Tial 38mm wastegate, K&N cone filter, alloy plenum chamber, samco hoses and inline thermo cooling system. FRAME: 1999 Hayabusa, de-lugged, ram air intakes smoothed, powdercoated frame, modified Aprilia/GSX-R subframe, billet coolant expansion tank, Matris steering damper with 916-style mounting bracket, Harris rearsets. FRONT END: 2008 Hayabusa forks, wheel and radial calipers, billet 'thug' yokes, Brembo RS brake & clutch master cylinders, Rizoma resevoirs, Renthal drag bars on one off risers, Motogadget clocks & idiot lights, 120/70/17 Pirelli Diablo tyre. REAR END: Spondon drag swing arm with 2.5lb Nitrous Oxide bottle, 2008 Hayabusa wheel with wavy disc, 200/50/17 Pirelli Diablo tyre. BODYWORK: 2004 Hayabusa fuel tank modified with intergrated boost and temperature gauges, GSX-R K6 carbon fibre seat unit and carbon fibre front mudguard. 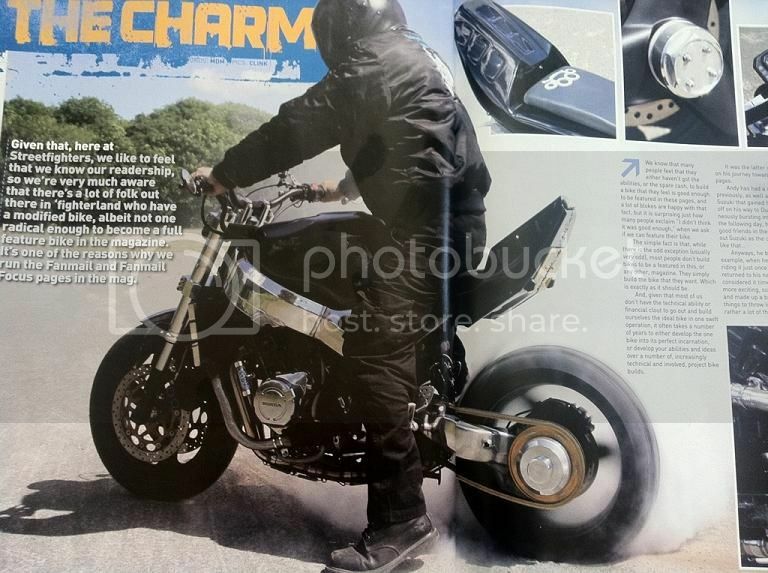 ELECTRICS: Yamaha MT-03 headlight on one-off brackets, flush mount tail light, LED indicators, heavily modified main loom, boost controller on seperate sub-loom. PAINT: metalflake black with white stripes and blue pinstriping. ORIGINAL MAKE/MODEL: 2005 Kawasaki ZX10R. ENGINE: Kawasaki ZX10R, standard head and cams,1.3mm head gasket, ceramic-coated pistons, modified ZX10R throttle bodies, stock ZX10R injectors, Walbro fuel pump, Sard fuel pressure regulator, Extreme Creations custom made plenum chamber and under tank intercooler fed through the air intake in the frame, Extreme Creations custom stainless turbo headers and stainless 2.5inch exhaust into Racefit titanium/carbon end can. Garrett GT2871 Turbocharger modified to accept Tial extrernal wastegate, Earls fittings & nylon braided turbo oil return hose. Turbosmart blow off valve, standard crank, Factory Pro gear shift star, new 2nd and 3rd gears, Goodridge clutch plates, Heavy duty clutch springs, Autronic SM4 computer and Autronic 500R CDI stock coils. Engine covers and sump powdercoated satin black, K&N air filter & pre filter, JMV carbon fibre clutch, ignotion and water pump covers. Custom twin thickness core radiator with CNC machined billet end tanks using PWR cores. Afam 1/2 inch offset 17T sprocket. POWER OUTPUT: 267BHP at 12PSI of boost. FRAME: Kawasaki ZX10R, modified around the front sprocket area to fit the wider chain offset because of the 240 section rear tyre, original subframe shortened and modified, one off underseat engine coolant overflow tank, JMV carbon fibre frame rail covers, ABM rearsets, Sprint steering damper, Hayabusa rear brake master cylinder with ABM resevoir, ABM frame sliders with billet mounts. FRONT END: ZX10R forks modified, anodised and fork bottoms powdercoated satin black, modified ABM top yoke with ignition switch removed and anodised black, BXP 50mm bottom yoke anodised black, forged Carrozzeria V-star 17x3.5 inch wheel, rebuilt and powdercoated ZX10R Tokico four pot radial calipers, 310mm dia ABM discs, EBC HH pads, ABM superbike bars, billet headlight surround, BXP billet idiot light/clock surround, Spiegler radial brake master cylinder & matching cable, Motogadget M-switch switchgear, Motogadget mini clocks, Motogadget sure shift gear indicator, ABM billet grips, HEL brakelines, RK 530GXW chain and Metzeler Sportec 120/60/17 tyre. REAR END: One off open sided BXP billet swingarm 6inch over to accept 240 section tyre. re-valved ZX10R shock, forged Carrozzeria V-star 18x8.5 inch wheel, ABM 220mm dia wavy disc, ABM mini caliper on BXP machined hanger, Metzeler M880 Marathon 240/40 VR17 tyre, Carrozzeria 43T sprocket. BODYWORK: Kawasaki ZX10R petrol tank, Oberon billet fuel cap, modified megatec front mudguard with on off mounts to look like linear sensors, ZX10R seat, Megatec Vampirus tail unit modified to blend into the JMV carbon fibre side panels. ELECTRICS: custom loom, Motogadget M-unit, M switches, M-lock ignition, the Autronic SM4 computer and 500R CDI with the bikes sensors and pick-ups, custom billet headlight uses 8x300 lumens hight intensity LEDs & a 50mm projector beam with a 100W Halogen bulb, Megatec LED tail light, LED BXP fork tube indicators. PAINT: Satin black all over. APPROX BUDGET: sit yourselves down!!! $60,000 aus dollars. ORIGINAL MAKE/MODEL: Suzuki GSX-R 1100 1992. 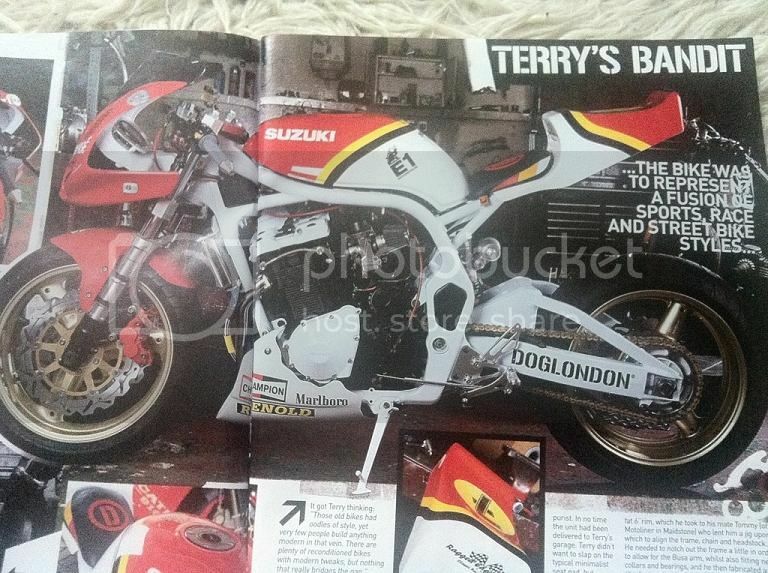 ENGINE: 1992 GSX-R 1100, Dynojet stage 3 carbs, K&N filters, one off stainless exhaust with aluminium cover plates. FRONT END: GSX-R 1100, wavy disc, red HEL Brake and clutch lines, Renthal clip-ons, TL1000 master cylinders with Rizoma resevoirs. REAR END: Modified stock swing arm, shortened and braced, GSX-R 1000 shock with one off rocker arm and dog bones, one off stainless steel torque arm, Renthal chain and sprockets. BODYWORK: one off front mudguard with mesh vents, Works HRC CBR1000RR Fireblade fairing mounted on stainless subframe, stock fuel tank, one off aluminium seat. ELECTRICS: One off headlight arrangement with projector beam lamps, LED tail light, LED strip indicators drilled into fairings. ORINGINAL MAKE/MODEL: Honda CBR900RR Fireblade. ENGINE: CBR900RR SC33, hydraulic clutch conversion, home made plenum chamber, Garrett Turbocharger. FRAME: Hand made box section frame and subframe, aftermarket rearsets. FRONT END: Suzuki GSX-R K9 forks, master cylinder and radial calipers. one off yokes, Oz racing wheel, Brembo discs, HEL brakelines, Renthal bars, CBR900RR switchgear, Acewell dash recessed into fuel tank. REAR END: Aprilia RSV-R swing arm, Ohlins shock, Oz racing wheel, Braking rear disc, SFB torque arm, Renthal chain and sprockets. BODYWORK: Cut down GSX-R k9 front mudguard, home made fuel tank and seat unit, Yamaha YZF125 Seat pad. 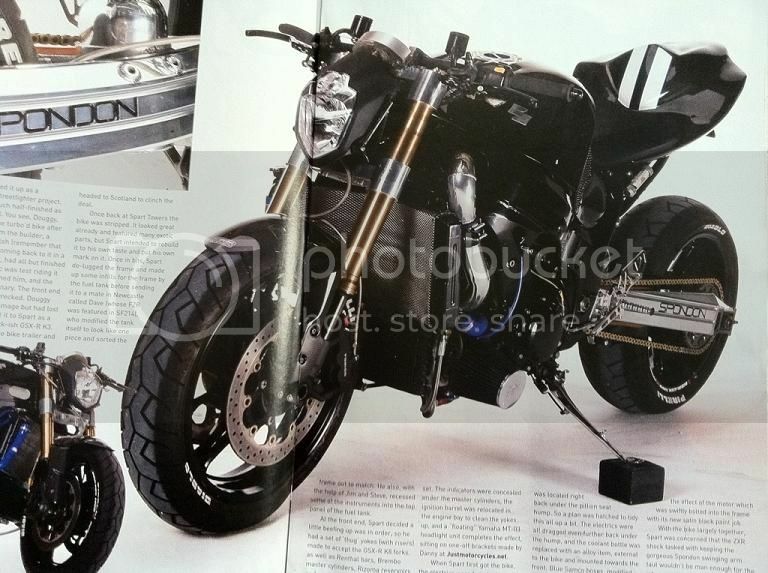 ELECTRICS: Modified CBR900RR main loom, Yamaha MT-03 headlight, LED tail light, mini indicators. ORIGINAL MAKE/MODEL: 1996 Honda CBR900RR Fireblade. ENGINE: standard 919cc Fireblade stage 3 dynojet, K&N filter, Shark Evo Blade full exhaust system with home made end can made from a carbon ships mast. FRAME: Honda Fireblade one off subframe with battery box and undertray, aftermarket footpegs. FRONT END: YZF 750 forks, wheel and discs, one off yokes with stainless steel steering stem, stops and one of risers, re-worked wheel spacers, R1 calipers, homemade braided brake lines, fat bars, Fireblade master cylinder & switchgear, Acewell digi speedo working through original sprocket pickup. REAR END: Honda VFR750 swingarm, Triumph 955i wheel, hub and disc, VFR750 caliper & torque arm, GSX-R 1000 K4 shock with VFR linkages, DID gold X-ring 530 chain conversion with Talon rear sprocket & steel front. BODYWORK: German style front mudguard, Standard Fireblade petrol tank, one off seat, german seat unit and undertray. Nice idea Ben. I added a link to the magazine website in your first post, I've always enjoyed a quick flick through (over?) it. love the Hayabusa in the first post.... well most of it, am not a fan of extended swingarms. cheers ID, i should have done that but it didnt occur to me. also also when i get round to uploading off the SFOC website (temporarily closed) itll take me eeeeeven longer as ill have to wait for someone to send me the spec list. ORIGINAL MAKE/MODEL: Suzuki Bandit 1200 Mk1. ENGINE: Bandit 1200 engine, standard carbs rejetted to suit cone filters, Goodridge oil cooler & cam links, aftermarket exhaust headers with one off carbon end can. 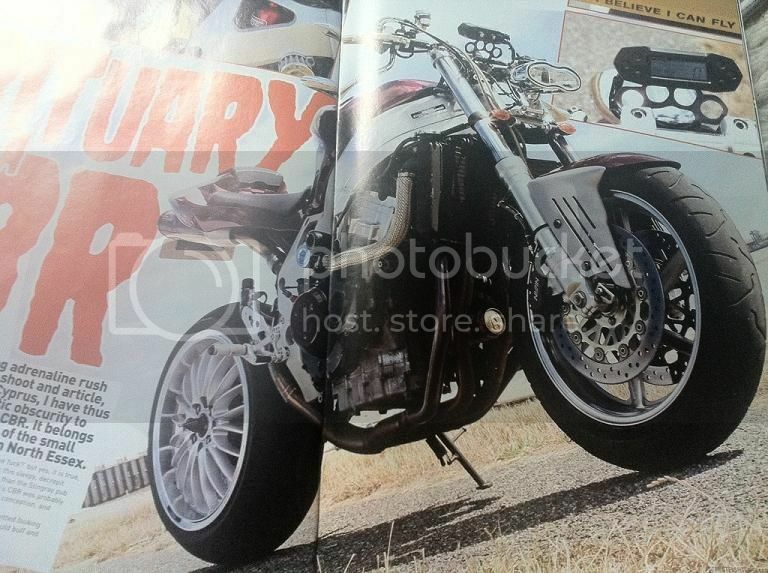 FRAME: Modified bandit 1200 frame, one off rearsets, adjustable shock mount, one off top fairing mount. 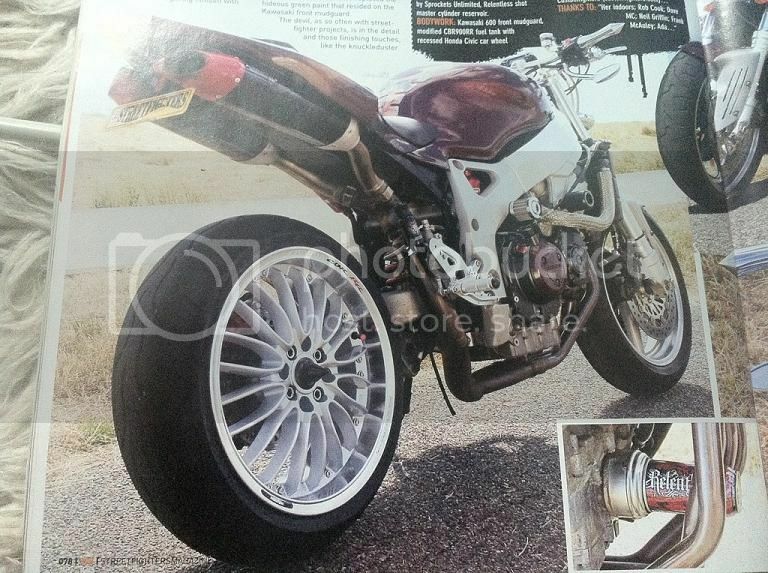 REAR END: Suzuki hayabusa Mk1 swing arm shock wheel and caliper, wavy disc, goodridge brakeline. BODYWORK: Standard tank with billet filler cap, Ragged Edge RG500 seat unit, Buell XB-9R headlight nose fairing and bracket, bandit belly pan, Speed triple front mudguard. ELECTRICS: Relocated ignition, modified loom to suit. 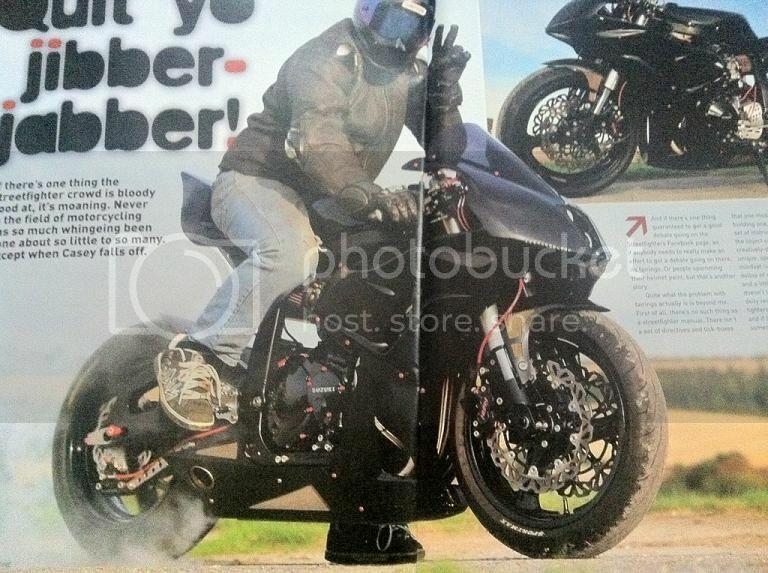 CBRRRT'S Fireblade, work of art!! ORIGINAL MAKE/MODEL: 1996 Honda CBR900RRT Fireblade. ENGINE: Standard 1996 CBR900RR with Crossflow air filter, CBR/R1 hybrid exhaust system. 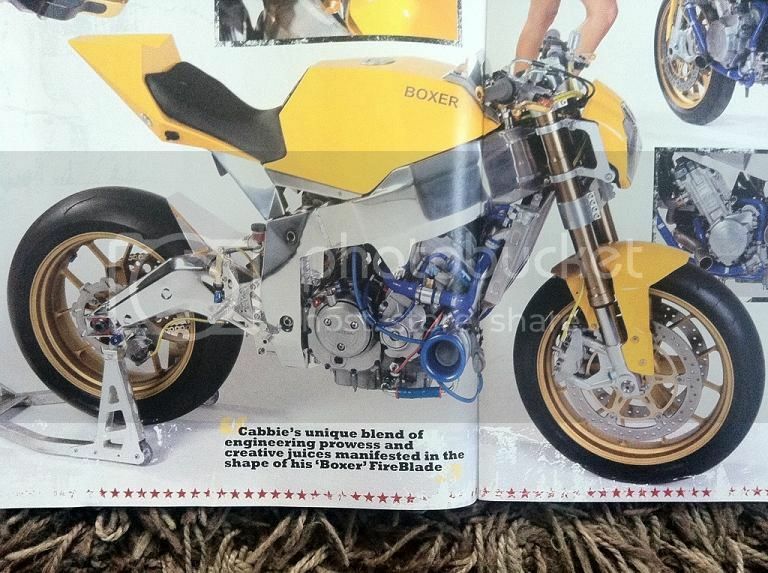 FRAME: 1996 Honda CBR900RR, 2005 R1 subframe, adjustable race rearsets. FRONT END: Stock CBR900RR front end with risers, flat drag bars, with billet grips, billet aftermarlet master cylinders, Venhill braided brakelines, CBR600 left hand switch gear with choke lever, KOSO DB-01 clocks in knuckleduster surround. REAR END: 1994 VFR750 swingarm/disc/caliper and torque arm. CBR900RR shock, Honda Civic car wheel with one off spacer, Venhill braided brakeline. BODYWORK: Kawasaki 600 front mudguard, modified CBR900RR fuel tank with recessed Honda Civic car wheel centres, fibreglassed tank to fit R1 5VY 2005 seat unit. ELECTRICS: Modified main loom, Highway Hawk headlight, LED R1 rear light, aftermarket front indicators, LED rear indicators. ELECTRICS: Yamaha MT-03 headlight on one-off brackets, flush mount tail light, led lighting indicators, heavily modified main loom, boost controller on seperate sub-loom. 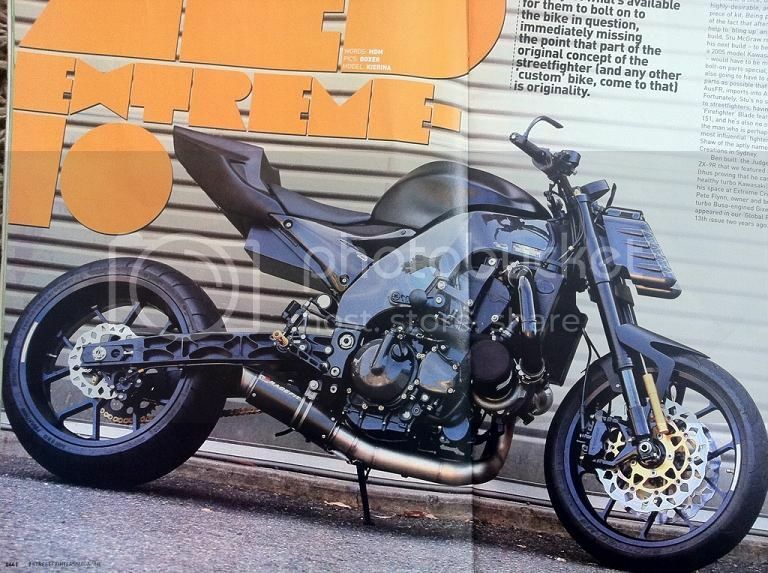 What sort of custom work are you going to do to the street bike when you get it and what will be your base-bike?